Get the new sound of the summer again. This massive collection which features around 1.2GB of raw and previously unheard material is a must for experimental producers looking for cutting edge sounds and samples to infuse into their musical productions. These pristine 24Bit samples are based around the 118 - 125 Bpm mark but can equally be used in new forms of Drum & Bass, Cinematic and Downtempo styles alongside House & Electro. Think Daft Punk Riffs and Filter sweeps, Mount Kimbie Cinematics, Mode Selektor Glitches, Lazer Sword Synths and Four Tet beats, and you will start to get a picture of what this collection is all about. Utku S utilizes inspiration from the past to create a forward thinking sound palette that is very much about the sound of now and the smaller acts that are ascending from the underground in dance music circles. 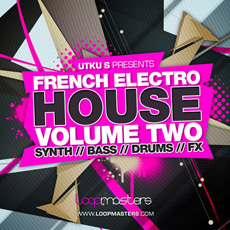 French Electro from Loopmasters includes 332, 24Bit Loops and 97 One Shot Samples. In detail this mammoth Future Electro Sample pack includes 84 Bass Loops, 63 Drum Loops, 28 Glitched Vox Loops, 11 Guitar Loops, 77 Synth Chord Loops, 30 Single Bass Tones, 30 Single Drum Hits, plus 38 Single Synth Samples. From Tech to Electro, Cinematic and Glitch - Get the new sound of the summer with this all new collection of French Electro sounds from Loopmasters and Utku S.